Seven Days Blogs: Freyne Land: Cheer up! Sure Ol' Dubya got his guy Mukasey into Alberto's attorney-general seat despite Senate Judiciary Chairman Pat Leahy of Vermont's opposition, but....life goes on. It ain't over t'il it's over. WASHINGTON (Thursday, Nov. 29) – Taking the next step to enforce subpoenas that the White House has refused to heed, Senate Judiciary Committee Chairman Patrick Leahy (D-Vt.) Thursday ruled that White House claims of executive privilege and immunity in the Senate’s investigation of the mass firings of U.S. Attorneys are overbroad, unsubstantiated, and not legally valid to block current and former White House officials from fulfilling Judiciary Committee subpoenas. Leahy directed them to comply immediately with the subpoenas that were issued by the Committee earlier this year. Yes, indeed, Ol' Karl Rove the spinmeister may have landed the big TV network commentator gig for 2008, but his life may be anything but worry free. Leahy’s ruling on the White House’s claims of executive privilege is the next step in enforcing the Committee-issued subpoenas to Bolten, Taylor, Rove and Jennings. Failure to comply with the directive may lead the Committee, and the full Senate, to consider holding the White House in contempt. read more here under What's New? AND here's the full six-page ruling by St. Patrick. A taste: "...without support is the White House claim that Mr. Rove is immune from the obligation to appear in response to a Senate subpoena. There is no proper basis for Mr. Rove's refusal to appear, and it flies in the face of legal and historical precedent. Since World War II, 74 presidential advisors, in positions of proximity to the President similar to Mr. Rove, have testified before Congress, many of those compelled by subpoena. Even the President has not been immune from compliance with subpoenas." Dear get bent...don't blame the illegal immigrant problem on Patrick. the problem is with the business owners who hire illegals and the fact that the administrations of Bush one, Clinton, and Bush two have refused to go after the people doing the hiring even though it is against the law to hire undocumented workers. You want to solve the illegal immigration problem, go after the people who offer them jobs. You are a funny guy, JPC, but unless your ancestors were Native American, you should stfu about immigrants, illegal or otherwise. You need more Freyne and less O'Reilly. After a spring, summer, and autumn of watching this precious rhetorical saber-rattling by Sen. Leahy and others, after a spring and summer and autumn of waiting for these words to come to actual action, could we finally at long last be on the precipice of something resembling the courage to demonstrate fidelity to Constitutional duties? Nah. It's just more words. Neither the good cop nor the bad cop parties (which is which- or does it matter?) aren't gonna do a damn thing to stop the Dear Leader and his cabal. ncm, I agree with you in that employers caught with illegals need to be severely punished. They need to be fined such that it no longer becomes finiancially worthwhile to employ these people, however Senator Leahy is in charge of this, and has turned a blind eye to a lot of things regarding steps to limit the accessibility of illegals. He has voiced his disapproval of the "long"waits at the border for example, and he made no move to stop large banks who a while back started offering credit cards to people without a ssn. That seemed like a no brainer. After to writing to him regarding it his was response was he'd look into it. MsRee, I am glad I can amuse you. Yes my ancestry does include native americans. Thanks for asking....your lack of interest in upholding the laws of this country are disturbing. FYI I have never ever in my life watched O'Rielly. You seem to believe that anyone who disagree's with your point of view can't possibly have formed that opinion on there own. It is a little high and mighty don't you think? Leahy and the whole senate know that Bush didn't do anything illegal in replacing judges. It is quite clear that the federal judges can be appointed and replaced at the whim of any president. As we all know, this happens with almost every administration change and it is done for political reasons only. When judges were fired Bush and everyone else knew that it was for political reasons just as it is at the beginning of a new administration. 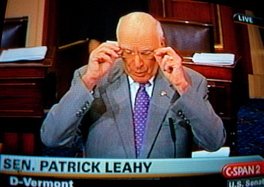 Leahy wants to question people in hopes of embarrassing Bush and not to prove tha Bush has done anything illegal. If Leahy doesn't like the current process, he should put his efforts into getting the law changed. He's great at grandstanding, but not so good at actually accomplishing anything. Wrong again, JPC. The laws are already on the books. They were passed in 1986. It is up to the administration to enforce the laws. "Wrong again, JPC. The laws are already on the books"
When was I wrong the first time? And what laws are you talking about specifically? Especially since in neither of my posts did I mention any laws? FYI, it isn't up to the executive branch to enforce laws, that would fall under the judical branch or at least thats what pro-pot people will tell you with regards to Sand and Douglas. Psst. Guys, whaddya think, should we tell Gunnergo that Bush didn't fire judges, but rather US Attorneys? And that, no, once they're appointed judges cannot be replaced at the whim of the President, or anyone else, thank goodness?